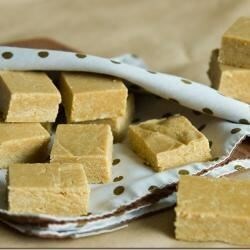 "You can make this easy fudge-like sweet using salted peanuts if you like. This will give it a slightly salty bite which is common in Brazil." Line a 9-inch square dish with waxed paper. Pulse the peanuts and biscuits together in a food processor until the mixture resembles coarse flour. Add the sugar and pulse to mix. Pour the sweetened, condensed milk into the mixture and process until the mixture forms a ball that pulls away from the sides of the food processor bowl. Transfer the mixture to the prepared dish and press with your hands into an even layer. Allow to sit at least 15 minutes, up to overnight. Remove from the dish and cut into squares to serve. Store in air-tight containers between uses.